This clash of young stars was a highlight of the second round of the Individual Women’s event of the SportAccord World Mind Games 2014. 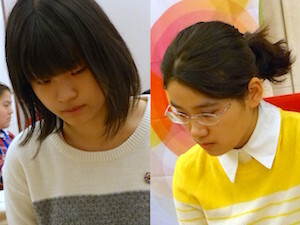 Japan’s 16 year-old Fujisawa Rina took black against China’s Yu Zhiying, also 16 years-old and the winner of this event last year. Fujisawa Rina is the youngest ever Japanese female player to become a professional and also to take a title. She is the granddaughter of Fujisawa Shuko, one of the best players of his era. Yu Zhiying has been scoring many wins in high-level events, including winning the 21th Xinren Wang this year and taking second in the 2013 Bingsheng Cup. 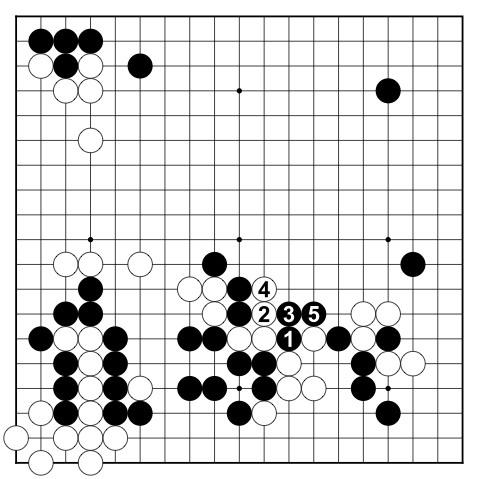 The game began with an interesting squeeze tesuji by Fujisawa starting from move 11 where White was constricted to the corner while Black took outside influence (click here to download the sgf file). The exchange of Black’s move 15 for White’s move 16 was however good for White, giving Black an uncomfortable empty triangle and making the overall result equal for both players. After settling their claims to the top-left and lower-right corners in standard fashion, Yu began a surprising manoeuvre. She played atari then pushed (moves 54 and 56) starting a wild attack with bad shape. This is likely to be a mistake, with an extension (move 1 in Diagram 1) being the more natural move. See Diagram 1 for the most likely continuation, where Black plays atari at move 2 of the variation. If Black were to extend instead at 9, White would push at 2, Black hane, then White takes a (good) empty triangle, giving her a better result than in the game. The fight continued with Black looking good after the exchange up to move 67. 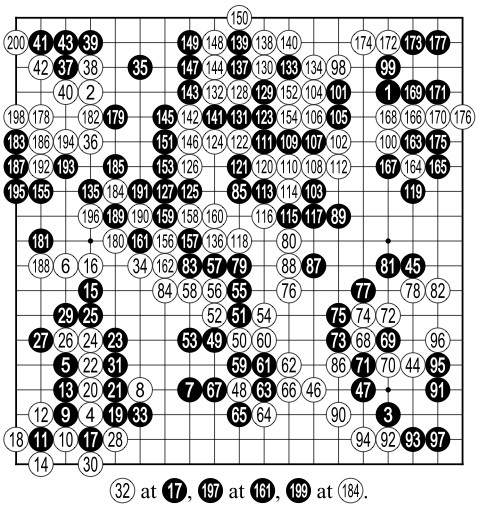 Fujisawa’s move 75 however was too slack, at a point where it was imperative to take profit. Diagram 2 shows a variation starting with Black’s cut at move 1 that is far superior. Black is happy to capture the three stones if White covers the lower-right black group on move 78. 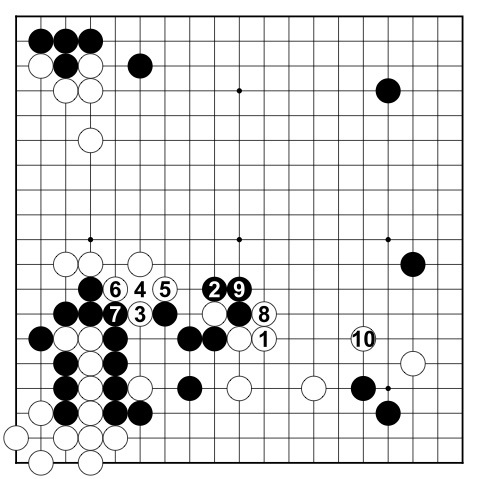 Thanks to Black’s loose play, Yu was able to make life in the lower-right while attacking Fujisawa’s corner. Black cannot keep this corner alive and still save the two stones (moves 47 and 71). White now turned to the top-right, where a dangerous-looking invasion at move 100 is actually a serious threat as White’s lower group is already alive. After move 118, White had the miai of striking at Black’s right group and pushing through (with move 120). Even though Yu’s group had no eyes on the right side, Black cannot save all of her outside stones. The game is now over.